"Indiangrass" redirects here. It may also refer to other members of the genus Sorghastrum. Sorghastrum nutans, commonly known as either Indiangrass or yellow Indiangrass,  is a North American prairie grass found in the central and eastern United States and Canada, especially in the Great Plains and tallgrass prairies. Sorghastrum nutans is prominent in the tallgrass prairie ecosystem and the northern, central, and Flint Hills tall grassland ecoregions, along with big bluestem (Andropogon gerardi), little bluestem (Schizachyrium scoparium) and switchgrass (Panicum virgatum). It is also common in areas of longleaf pine. It regrows with renewed vitality after fires, so controlled burns are used, replacing extirpated large herbivores (i.e. bison), for habitat renewal. Indiangrass is the official state grass of both Oklahoma and South Carolina. ^ "Sorghastrum nutans". Germplasm Resources Information Network (GRIN). Agricultural Research Service (ARS), United States Department of Agriculture (USDA). Retrieved 2011-03-03. ^ a b Hilty, John (2016). 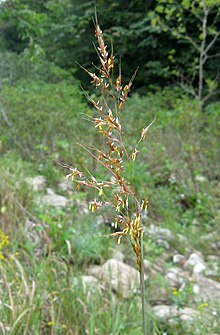 "Indian Grass (Sorghastrum nutans)". Illinois Wildflowers. Missouri Botanical Garden: Sorghastrum nutans — horticultural info.